Come join national touring comedian Smiley Joe Wiley as he brings his irreverent style of hilarious to Hooters' Night Owl Showroom every Wednesday and Thursday. Best known for his appearances on BET's ComicView, Comedy Central and all over the globe on Carnival Cruise Lines any Smiley Joe show is not to be missed. The show is hosted by comedian TEKG; the show also features rotating special featured guests and surprises that will have you laughing from start to finish. Come join national touring comedian Smiley Joe Wiley and a multitude of his comedic friends from all over the nation as he brings his irreverent style of hilarious to Hooters Casino Hotel Night Owl Showroom every Wednesday and Thursday. 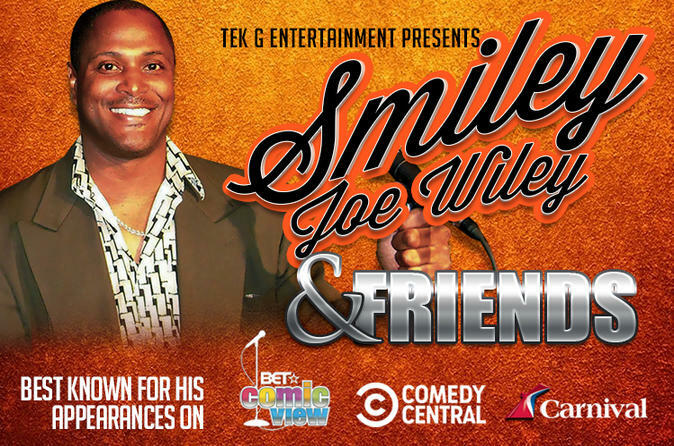 Best known for his appearances on BET's ComicView, Comedy Central and all over the globe on Carnival Cruise Lines any Smiley Joe show is not to be missed. The show is hosted by comedian TEKG; the show also features rotating special featured guests and surprises that will have you laughing from start to finish. Door at 8:30 pm; Show at 9:00 pm.